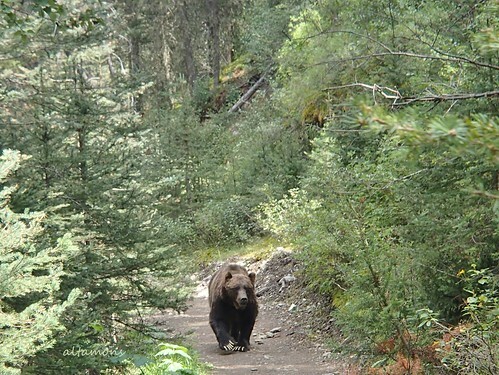 I know from experience how scary it is coming face to face with a grizzly bear on the trail. Over the years I have been confident - if cautious - while hiking in the mountains, knowing what to do if I encountered a bear. That confidence was shattered in August 2015 when, on a very steep and narrow trail, I came around a bend in the path and was eye to eye with a large grizzly. The very next day, I purchased bear spray. But now what? I don’t want my first usage to be in an encounter situation. WildSmart to the rescue. WildSmart is an organization which began in 2005 to provide a “proactive conservation strategy that encourages efforts by communities to reduce negative human-wildlife interactions.” One of their initiatives is a weekly newsletter ‘On the Wild Side’, a bear and wildlife activity report in the Bow Valley. If you follow me on Twitter, you may have seen that I have been tweeting links to their reports for several years. WildSmart also offers a number of educational programs. This weekend at the annual Friends of Kananaskis Country - Trails Fest, I participated in a workshop which allowed me to practice with (inert) bear spray and prepare for a hike in bear habitat. A WildSmart instructor describes and demonstrates the do's and don'ts of bear spray. Participants were coached on how to properly hold and fire the bear spray. I had my own opportunity to scare this bear off. Our WildSmart guide helps us interpret a black bear footprint near the side of the trail. We had previously observed a bear at a considerable distance. Our hiking choice was to select a different trail to avoid any further contact. Later, we came across a bear feeding in the shrubbery. This time, we backed carefully away so as not to disturb the bear. Next we encounter a bear that apparently just wants to pass us on the trail. In retrospect, I believe that my initial encounter with the grizzly was of this type. Best advice, have spray on the ready, back off and allow the bear to continue on its journey. Our final encounter was with a charging mother bear and her cub. Our WildSmart instructor quickly deployed her spray. After this event, we encouraged our ‘bear’ to come out of the bush and we had a great discussion about what we had learned at this event. Thanks to WildSmart for this engaging learning opportunity. If you get the chance to take in one of their training sessions, I highly recommend it.